Dhaka, 24 Jan, Abnews: Praising the role of the BEPZA in the successful operation of the country's Export Processing Zones (EPZs), Prime Minister Sheikh Hasina today hoped that it (BEPZA) would also show its efficiency in effective running of the newly designed Special Economic Zones (SEZs) across the country. "BEPZA has immense role in diversification of the goods, attracting foreign investment, export growth, creating new employment, and women empowerment. I hope that BEPZA will play the same role in successful operation of the 100 SEZs to attract more foreign and local investment and employment generation," she said. The prime minister was inaugurating 'BEPZA International Investors Summit 2018' at Bangabandhu International Conference Center (BICC) here today. Sheikh Hasina said her government had extended all support to the private sector for rapid industrialization in the country after assuming office in 1996. Then, her government for the first time had organized BEPZA Investors Conference with participation of investors from home and abroad, he added. At that time, she said, only two EPZs - - Chittagong EPZ and Dhaka EPZ-- were in operation with limited scale. The Awami League government expanded the Chittagong and Dhaka EPZs, and set up export processing zones in Comilla, Mongla, Ishwardi and Nilphamari to create employment opportunities in remote areas. "Most of the EPZs, now operating in the country, were set up during Awami League's tenure and the EPZs have brought a dramatic change in the socioeconomic condition of people in those areas," she said. The Summit has been organized aimed at informing the people about the successes of BEPZA during the present government under the dynamic leadership of Prime Minister Sheikh Hasina as well as showcasing the country's achievements in field of investment, exports and employment through BEPZA. The summit will focus on the special role of BEPZA in strengthening the economic foundation of the country through a peaceful environment-friendly industrial atmosphere, industrialisation, national export and foreign direct investment (FDI). Commerce Minister Tofail Ahmed and chairman of BEPZA Investors' Association M Nasir Uddin addressed the function while BEPZA Executive Chairman Major General Md. Habibur Rahman Khan gave welcome speeches. Chang Yoe Chong, Managing director of the Evergreen Products Factory (BD) Ltd., a Chinese Company in Uttara EPZ and Panna Yasmin, an employee of Karnaphuli EPZ in Chittagong also spoke it. On the occasion, the prime minister formally launched Mirersarai Special Economic Zone through a video-conference. She launched the operation of the special economic zone with the unveiling of its foundation plaque. Minister for Housing and Public Works Engineer Mosharraf Hossain and Deputy Commissioner of Chittagong Md. Jillur Rahman spoke on the occasion from Mirersarai side. The economic zone will be established on 1,150 acres of land and the land has already been allocated for the zone. "I hope that BEPZA will be successful in running the Economic Zones like the EPZs," the premier said. Sheikh Hasina said her government has attached highest importance to private sector as the sector is the main driving force of the country's economy. Mentioning that the private sector is playing an important role in expanding industries and exports, creating employment opportunities, she said the government is performing the role of a facilitator to promote the private sector. 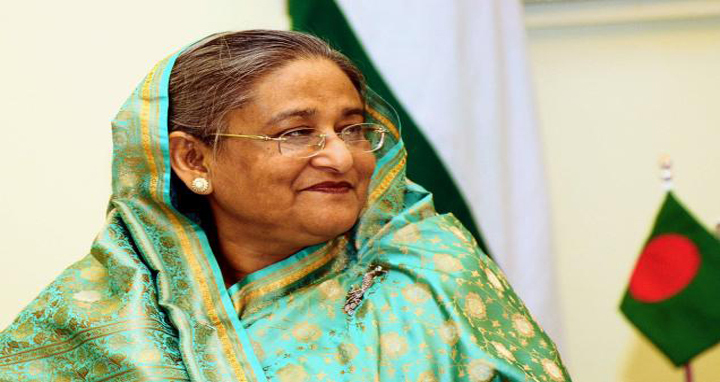 Sheikh Hasina said one of the prime objectives of the SEZs is to keep away the valuable agricultural lands from industrialization. Unfertile and fallow lands should be selected for establishing industries instead of those where 3/4 crops are grown per year, she said. The premier said investment of BEPZA has been increased two folds while export increased 2.5 folds during 2009-2017. Some 468 industries are in operation in eight EPZs, employing about five lakh people with 64 percent women. During the last nine years, some 283,620 new jobs have been created in the EPZs, she said. The EPZs under BEPZA is contributing about 20 percent to the total national exports and foreign investment, she said, adding due to our investment friendly policies, investors from 38 countries, including China, Japan, South Korea, India, US and UK have been producing world famous brand-items in the factories of EPZs in Bangladesh. Urging the foreign investors to select Bangladesh as their investment destination, the prime minister said Bangladesh has provided highest facilities, including cent percent repatriation of capital and profit and tax-holidays. Pointing out huge skilled and comparatively low-cost workers, she said Bangladesh has overcome the hurdles in the fields of electricity, energy, roads and other infrastructure facilities. Focusing on some development projects in the country, the premier said some projects were undertaken for creating conducive investment atmosphere. "Work on metro-rail in the capital is underway and we have been implementing the Padma Bridge project with our own fund. Once completed, the Padma Bridge will bring a revolutionary change in the socioeconomic condition of the people," she said. The prime minister said Dhaka-Chittagong and Dhaka-Mymensingh highways have been turned into 4-lane while work for turning Dhaka-Bangabandhu Bridge highway into 4-lane is underway. An international airport will be built in the country while a domestic one at Bagerhat, she added. The prime minister praised the initiative of the BEPZA to build environmental-friendly industrial zones and a low carbon green zone. A garment factory at Adamjee EPZ topped the world list of green factories which is a pride for us, she also said. Laying importance on workers-owners relation in industries, the prime minister said her government has enacted 'EPZ Workers Welfare Council and Industrial Relation Law 2010' for protecting the rights of the workers. Under the law, workers of EPZs can elect their representatives through secret ballots to bargain with the owners on the workers' rights, she added. Terming her government as a pro-workers and distressed people government, Sheikh Hasina said "we are very careful to protect the rights of the workers." She urged the workers not to be misguided by others saying the government has formed minimum wage commission for increasing the pay and allowances of the workers of garment industries. She said over the last 7 years, her government has increased the wages and allowances of the workers of EPZs twice with giving healthcare services and medicines at free of cost. The prime minister said women workers are enjoying maternity leave and other benefits, adding children of the workers are getting facilities to study at the EPZ public schools and colleges as most of the EPZs have daycare centres. Sheikh Hasina said her government has been working to turn Bangladesh into a middle-income country by 2021 and a developed and prosperous one by 2041. To achieve these goals, she said, the country needs to create employment opportunities through attracting investment from home and abroad.